Description: BellCommander works with the Digital Acoustics IP7 IP intercoms, speakers, and audio devices to provide multi-zone audo and bell scheduling. 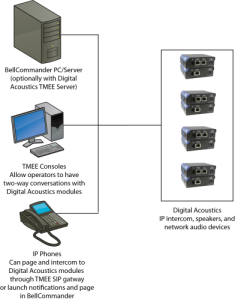 BellCommander can either integrate directly with IP7 modules or interface with Digital Acoustics TMEE Server to provide a full distributed intercom and bell system. BellCommander also includes emergency notification features which allow audio to be looped to Digital Acoustics units. Notifications can be customized to play custom messages and scripted to trigger relays and message boards through add-on modules. The Digital Acoustics Versions of BellCommander are priced separately from other versions of BellCommander. For pricing, please contact us or an authorized dealer.